The <meter> tag specifies a scalar value within an accepted range, or a fractional value. The <meter> tag is also known as a gauge. The <meter> tag belongs to flow content, phrasing content and palpable content. The <meter> tag supports Global Attributes and Event Attributes. HTML 4 does not supports <meter> tag. 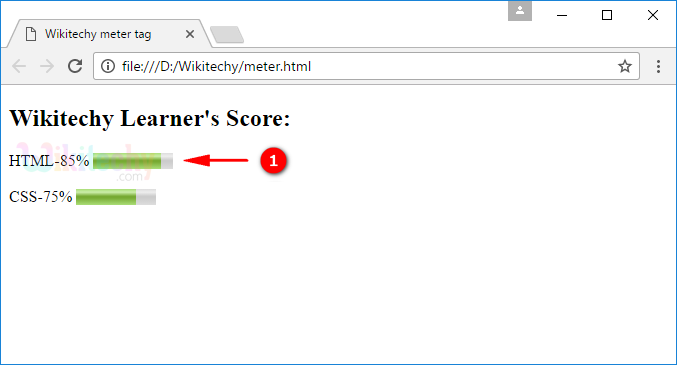 The <meter> tag is new to HTML 5. <meter> tag is used to display a measurement with a graphical view in a range. value attribute used to define the value of the <meter>. HTML -85% and CSS-75% are displayed two different meters. value number No Yes Defines the current value of the gauge. min number No Yes Describes the minimum value of the range. max number No Yes Determine the maximum value of the range. optimum number No Yes Indicates which value is the optimal value for the gauge. low number No Yes Mentions the range which is treated to be a lowest value. high number No Yes Determines the range which is treated to be a highest value. form form_id No Yes Defines one or more forms belongs to the <meter> element. The <meter> tag have not been used to display progress. The <progress> tag is used for progress bars. The content inside the <meter> tag does not displayed in browser.